Found throughout caves in Europe, the Cave Bear (Ursus spelaeus) was named after the places where its fossils are commonly found: caves from England to the Caspian Sea with the majority concentrated in Central and Eastern European mountain chains. Fossils found in caves near the North Sea and in The Netherlands show that the range of Ursus spelaeus eventually spread into the lowland forests of western Europe. In this last region, populations drastically declined around 40,000 years ago finally becoming extinct during the last glacial period. The bear group Ursus, is a member of the order Carnivora. 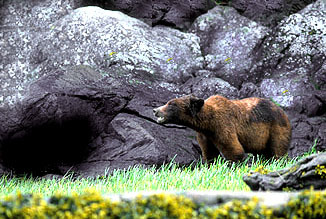 Ursus is comprised of the six remaining modern bear species. The Protursus subfamily was the starting point dating back to an origin about 10 million years ago. Around 5 million years ago from this group, emerged the species Ursus minimus, the ancestor of all Ursus bears. One offshoot Ursus species of bear, Ursus etruscus (Etruscan bear), gave rise to a line of Ursus bears that all became extinct. These three are Ursus savini (Savin's bear), Ursus deningeri (Deninger's bear), and Ursus spelaeus (cave bear). Ursus spelaeus was a huge omnivorous bear that resided in caves year-round compared to modern bears which only use caves as a shelter for hibernation. When standing on its hind legs, the height of this beast would have averaged 10 feet tall! Skulls have been found 20 inches in length! The closest relative is our modern day brown bear but the cave bear averages 30% greater in size. One way to differentiate a cave bear skull from a brown bear (and all other bears for that matter) is the sheer size, first off, and also the prominence of the brow and forehead, unique to the cave bear. 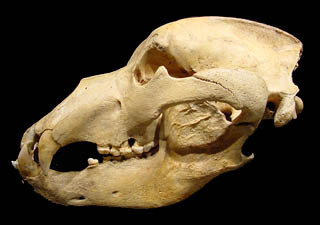 Modern bear skulls have a more gradual sloping forehead. It is believed that the cave bears' demise was aided by competition for food and shelter by a simultaneous existence with the brown bear. Evidence found in caves suggests that prehistoric humans either worshipped the cave bear or used its remains in religious rituals. "Temples" have been discovered intact within caves that were set up and left by Neanderthals with cave bear skulls set upon rock altars and arranged in formations. Instances of teeth and bones carefully lined up have also been discovered in caves once occupied by Neanderthals. In one cave in particular, a stone structure was found to have been erected by Neanderthals with a cave bear skull perched upon it and evidence of numerous spears being thrown at it. Caves have been discovered where Neanderthal and later, Cro-Magnon peoples, occupied caves after or on alternating periods with cave bears. Cave Bear fossils have been found from England to the Caspian Sea with the majority concentrated in mountainous regions of Central and Eastern Europe. BEWARE of so-called "RUSSIAN (SIBERIA) CAVE BEAR" fossils being offered on the market. THESE ARE NOT TRUE CAVE BEAR FOSSILS! While cave bear remains have been found in the region, it is another fossil bear species named Ursus uralensis that is being sold as Ursus spelaeus and being labeled as the "Russian Cave Bear". The Siberian species uralensis was NOT a cave-dwelling bear but is an extinct off-shoot similar to a modern Grizzly bear. Some dealers will call it Ursus spelaeus, some will call it the right species, but all will call their Russian bear fossils "cave bear" which is a misnomer.